Developers Connect (DevCon) Philippines is holding DevCon Summit 2013: Mobile Development and Beyond – The Biggest Mobile Developer Conference in the Philippines happening on November 30, 2013 (Saturday) at Cinema 4, SM Megamall. The event is a whole day conference that aims to bring together over 800 Information Technology professionals, students and educators from all over the Philippines to showcase the latest trends and opportunities in the mobile development industry. The summit features the prominent individuals from the international and local mobile development scene: John Britton of GitHub Inc., Micael Diaz de Rivera of Sulit.com.ph, Howard Go of Mochibits, Ramon Pastor of Numlock Solutions, Inc., Jon Limjap of Readify and more. Topics include Opportunities in Mobile Development in the Philippines, Solving Real World Problems with Mobile Apps, Essentials on Mobile User Experience, Trends in Android and iOS Development, and Cross Platform Solutions. Then a Show and Tell of proud chart topping Filipino Mobile Apps in the Play Store and App Store will follow. To register visit http://summit2013.devcon.ph/. Ticket price is PHP1,500 for Professionals and PHP1,200 for students. Ticket price includes t-shirts, event kit, meals, certificate of participation, more freebies from sponsors and a day full of fun learning! 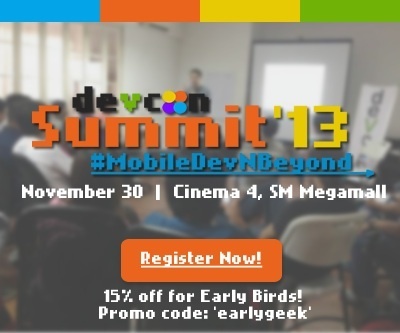 DevCon Summit 2013 #MobileDevNBeyond is co-presented by Globe Labs, Smart DevNet, GitHub Inc., and Orange and Bronze Software Labs. This event is supported by Deltek Philippines as Gold Sponsor, Microsoft Philippines and FIT Academy as Silver Sponsors, and Mozilla Philippines, StackOverflow and WhenInManila.com, TechTalks.ph as Technology and Media Partners. DevCon or Developers Connect Philippines is a non-profit organization that aims to empower Filipino developers and promote the “IT Pinoy Talent” by providing venues for IT students, educators, professionals and enthusiasts to sync, support and succeed. DevCon regularly conducts Code Camps, a workshop on different development tools, and Campus DevCon events which are school partnered events that aims to augment the academic learnings of students with up-to-date trends in the IT industry. With chapters in Metro Manila (main), Cebu, Davao and Cagayan de Oro chapters, DevCon has reached 20,000 participants since its founding in June 2009.